Today we’re bringing you a new house tour. It also happens to be our first international house tour! 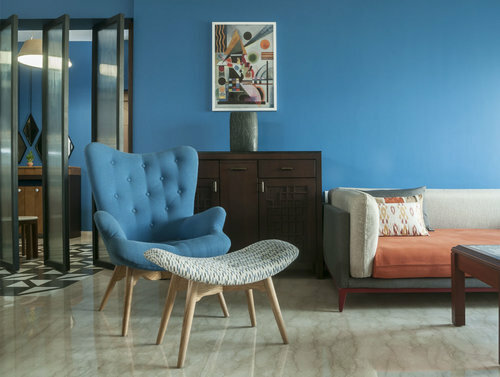 Located in the Sion region of Mumbai this space was designed by friends of the blog Huzefa Rangwala and Jasem Pirani of MuseLAB. The home is a large four bedroom apartment that the owners wanted reconfigured to better suit their needs. The main challenge was the large plus-shaped space that they wanted to accommodate a formal living area, a dining area, a den, and a very very large library. Let’s take a look at their approach to the design and how the space turned out. For this project the team turned towards the mid-century modern aesthetic. 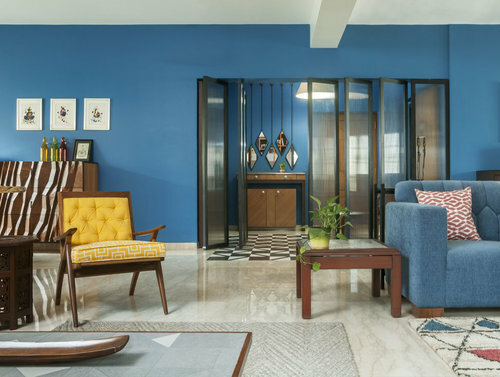 In their own words, “Mid-century modern aesthetic are both formal and organic; stylized with a certain effortlessness integrated with nature and open floor plans. 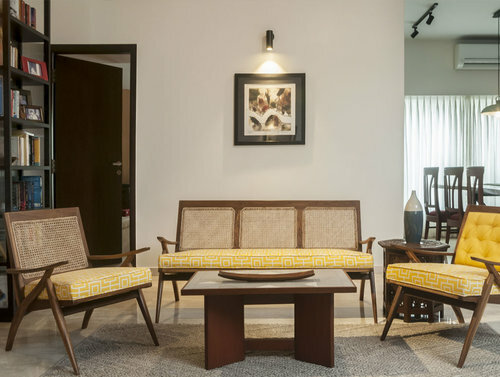 Function is as important as the forms characterized by simplicity, democratic design and natural shapes.” To help stay on budget the team upcycled a lot of the client’s existing furniture and gave them facelifts to fit the new design. They worked closely with the client who helped scour markets and shops to find pieces and materials for the project. The family was living in the home during renovations, which was an extra challenge. But by phasing the work and with patience on both ends the process went smoothly. Starting at the entry, they painted the walls a bluish green color which continues on the shorter walls in the main living area, with the ceilings all white. The flooring was done in white composite and grey quartz. Their idea was to create a rug in patterned stone that would flow from the foyer and peek into the living area. A fun fact about the flooring: the width of each row reduces as you move towards the shutters creating a skewed perspective. 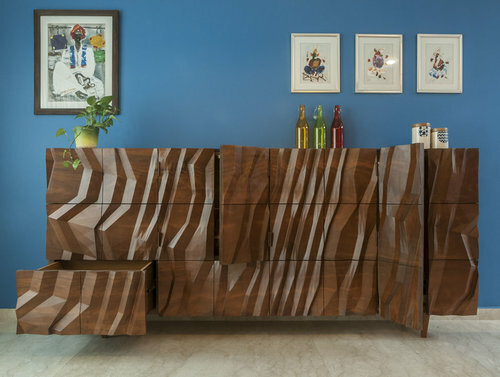 For the formal and informal living rooms the team upcycled most of the existing furniture. 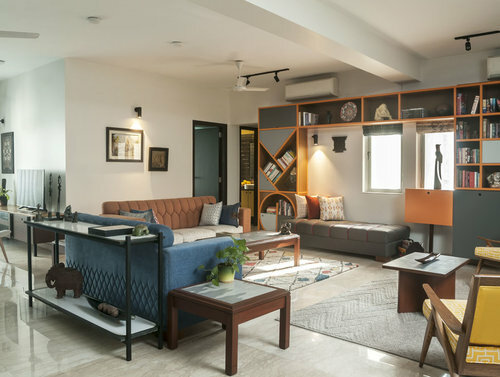 The seating, coffee tables, cane sofa and chairs (reupholstered in canary yellow), pepperfry chair and ottoman, the old bar, the media unit and the center tables were all upcycled. It’s truly an example of how even small changes can give a space a whole new look. 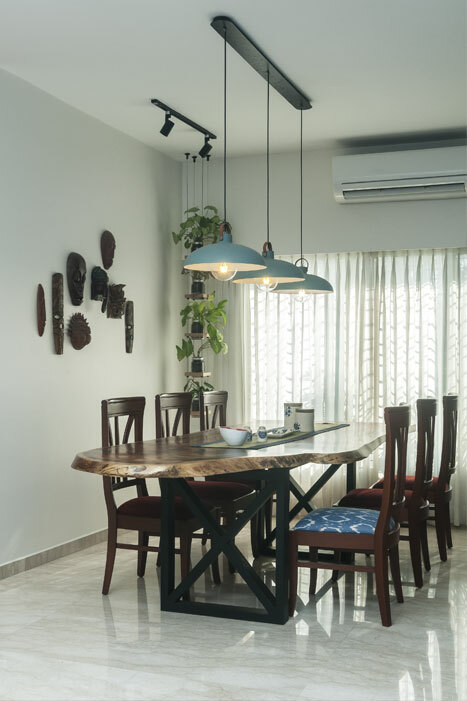 For the dining room they had a new custom table crafted from Suar wood sourced from Kurla. The clients had six chairs and they made two new chairs to replicate the existing ones. The fabric on the chairs (as in the rest of the house) is from Bharat Furnishings. Edison bulbs in the lighting keeps the mid-century modern aesthetic flowing through the space. The client wanted a large library because everyone in the family is avid readers. Obviously the highlight of the library is the bookshelf. The bookshelf was built from scratch. This was the first thing that was presented to the clients and in spite of requests to modify it slightly, we were able to convince them to retain it as is. And they loved the result. Designed in MS box sections, the shutters are coated in a PU finish and so are the MS sections. It was a difficult task to fabricate this unit given the various shapes to the left of the unit. An existing diwan unit was tucked into the architecture of the library; it became a cosy reading nook by the small windows. 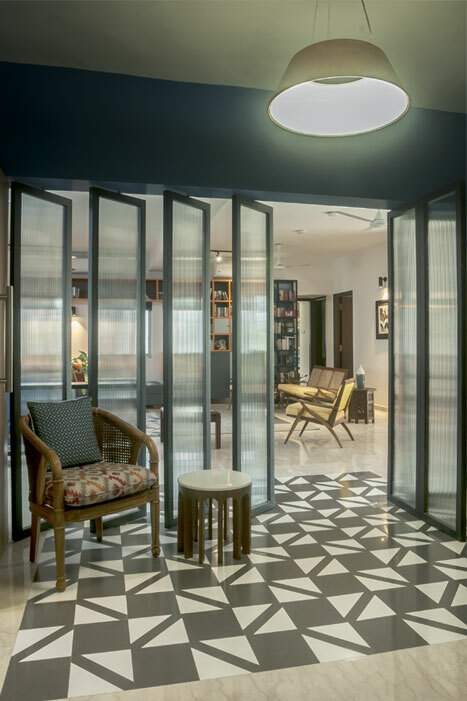 To the right was a sliding tall unit made in stained pine wood and fluted glass which not only made the unit dynamic but gave the clients additional space for keeping books and curious. For the client’s bedroom they kept things simple yet sophisticated. For the walls they used a very light English green color. 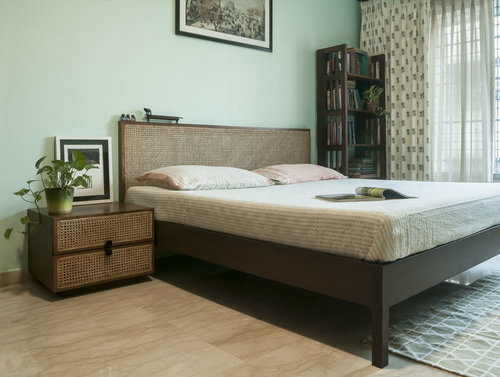 They chose cane for the headboard and the bedside table drawers as an extension of the cane sofas from the living room. The warmth of the wood furniture pieces beautifully combine with the English undertones to make a perfect bed and breakfast for the client. For the son’s room the client wanted a tiled brick wall. 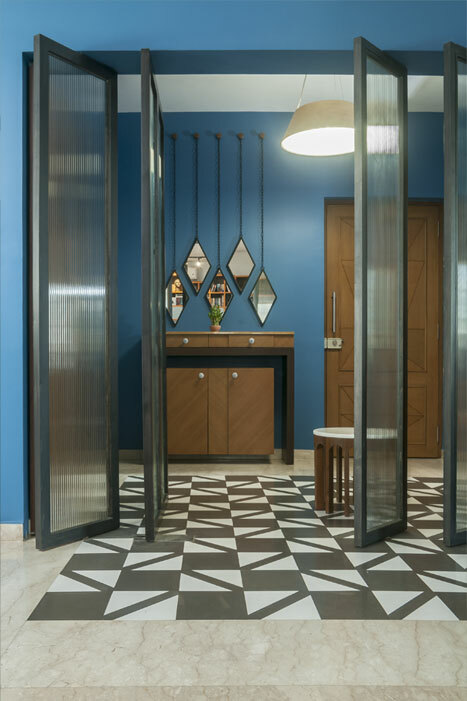 The laminated wooden flooring perfectly complemented the tile and the rest of the walls and ceiling were also painted white. 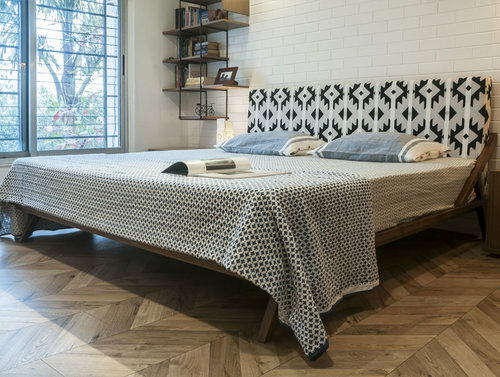 The large bed was made from teak wood and has a backrest in a bold Aztec patterned fabric. Thanks for sharing this space with us Huzefa and Jasem! Your clients are lucky to have such creative and dedicated designers on their side. If you’d like to see more of MuseLAB’s work make sure to check out their website or follow them on Instagram. It’s so great getting to see what homes from all around the world look like, and we hope to bring you some more international house tours in the future! While you’re here, do you have a home that you love? Do you have a space that went from not the best to out of this world? We want to hear from you! Just get in touch with us through the Contact Us page with some brief details about your space and we’ll be in touch for more information.